Does the Section 163(j) Interest Expense Limitation Impact the Investment Space? Does your entity incur substantial interest expense? Under the TCJA, your deductible interest expense may be limited starting in 2018. Every type of business entity is now subject to limitations on business interest expense deductions. If you are in the investment space you may read the word “business” and immediately come to the conclusion that this won’t apply in your situation. However, there are several areas in the investment space where you need to consider this limitation. Any business interest expense disallowed in the current year is carried forward indefinitely into future tax years. The limitation does not apply to taxpayers with average annual gross receipts of $25 million or less for the three-year period ending with the prior tax year. If you have commonly owned entities, you need to look at the control group rules to determine whether you meet this exception. ABC, LLC has taxable income of $300,000. Business interest expense is $300,000. 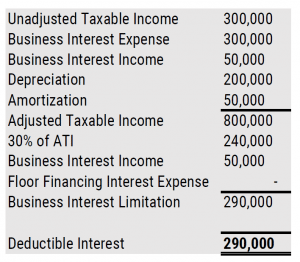 Business interest income is $50,000. Depreciation is $200,000. Amortization is $50,000. Generally funds won’t need to worry about the business interest expense limitation since investment interest is excluded from the limitation. However, there are some cases where this limitation will apply in the investment space. Portfolio companies. All portfolio companies will need to look at these limitations if they have debt financing. Loan origination funds. A loan origination fund is considered to be in the business of lending. As such, interest income and interest expense is business, not investment, and subject to these limitations. Leveraged blocker entities. The blocker’s ability to currently deduct interest expense will be severely limited or eliminated unless it has interest income or is allocated taxable income from the partnership in which it is invested. You may have a situation where the lender is withholding tax on the interest income and the borrower is disallowed a deduction on the interest expense. General partners of trader funds. Since the GP is actively participating in the business, his or her interest would be considered business rather than investment and subject to the limitation. Does it make sense to restructure your financing agreements? Instead of getting a loan from a broker, can you get the broker to structure the loan as a derivative instead? Should debt be restructured as preferred stock? Are you currently paying guaranteed payments? You should consider categorizing them as distributions so that you aren’t reducing your adjusted taxable income for purposes of calculating the interest expense limitation. Is the fund winding down but still using debt instruments? Your deductible interest will likely decrease. Are there other types of consideration that can be paid in lieu of interest in new deals that would avoid these limitations such as royalties, management fees, compensation and the like? While the 163(j) limitations only apply to business interest expense, these limitations go beyond what you would typically consider business and impact many areas in the investment space. It is important to be aware of these limitations so that you can plan around them and potentially mitigate their impact. At a minimum, every pass through entity will need to disclose certain information to all partners so they can compute the interest limitation at the partner level. Our team would be happy to discuss your particular situation with you and determine what actions can be taken. Please contact us with questions.